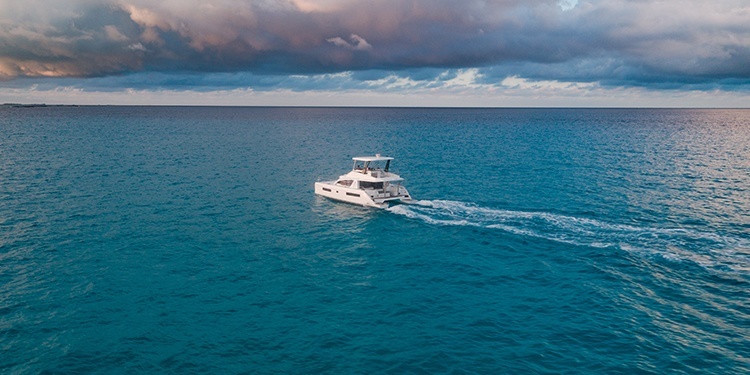 If you have spent years delivering power and sail cats on their own bottom from Cape Town to the Caribbean and Florida, then perhaps delivering a Leopard Powercat from Fort Lauderdale to Tampa might sound more like a vacation to you and less like work. Even more so when your stop overs involve island hoping from one place to the next and your only real worry (assuming your ship runs as well as this yacht did for this particular delivery) is arriving to each fuel dock before it closes for the day. I would trust that anyone who is embarking on this journey, or any journey of a reasonable distance on a boat for that matter, would take the time to do engine checks and ensure that all of the US Coast Guard safety gear has been installed. Basic engine checks on brand new Yanmar engines are very straight forward. You want to inspect the levels of the gear box oil, engine oil and coolant. Both the gearbox and engine have a dipstick which is easily located and have markings that are clearly visible which indicate your optimum fluid levels. Keep in mind that gearbox oil and engine oil is not the same thing. Checking the coolant level is also quite simple. The coolant filler cap is located on top of the engine. You can open the cap to check the level and fill up almost to the top if this is required. There is also an over flow container for the coolant which should be topped to the indicated lines on the container. As we were dealing with a brand new engine, the racor, which separates water from fuel should be clear. The racor in this instance is a clear glass bowl, in which you can see the diesel, however not all racors are clear. They may be an enclosed unit that you cannot see into. The Leopard 43 PC for for this delivery had been pulled off of the freighter coming from Cape Town, SA only late in the day, one day prior to setting off. Luckily, what she lacked in cleanliness on the exterior after three weeks on a freighter, she made up for on performance and indoor comfort. One of the first things I noticed was that this yacht had something that I have not yet seen on a Leopard Catamaran. Half of the instrument switch panel was on a digital switching screen where each instrument had an on/ off button on the touch screen. The screen could also show your fuel levels, water levels, and much more. One very handy thing about this, although I could name many, is the "Leave Your Boat" feature where when you are ready to head out for the evening and you select this button, everything will switch off on the boat except for the floor lights outside, the air con and the fridge/ freezer. This made leaving the boat quick and simple. And these features can be adjusted to your personal preferences if for example, you would prefer to not run the air con when you are not aboard. Of course it goes with out saying that you will want to stock the boat with some food. Delivering a new yacht requires that captain and crew bring their own stove for cooking. Because this trip was rather short and evenings are spent in a marina, we opted to make sandwiches for lunch and eat dinner on land. Weather is going to be another thing you will need to keep an eye on. For anyone making this trip for fun, you have the luxury of leaving as you please. When there is a time sensitive matter, for example getting a yacht to a boat show in time for move in, I cannot always be so lucky-- the job has to get done. One website I recommend for checking the weather is www.passageweather.com, but there are other good ones out there too, for example www.windguru.cz. One more thing I should mention before we depart is that you could also get from point A (South florida) to Point B (the Bay Area) via the Okeechobee Waterway. Due to the current conditions in Lake Okeechobee, it was decided that the best route would be to go around Florida instead of through it. Although, if you are planning to come back to South Florida you might consider taking the route home this way to complete the full circle. You could consider it a practice round in preparations for completing the Great Loop. Wake up, fuel up, crank up the RPMs and go. Or just take it slow-- the choice is completely up to you. The first stop on the first leg of the journey is going to be Faro Blanco Marina in Marathon, FL. Don't get distracted by the city lights of Miami because if you are anything like me you will appreciate the Florida Keys much more. If you maintain a cruising speed of 15 - 17 knots you can make this leg of the journey in about seven hours. If fuel consumption is a concern of yours, by all means take it slow and enjoy the ride. While the fuel dock at Faro Blanco doesn't close until 7pm, it also opens up again at 7am, providing time either at the end of your day or the start of your day to fuel up for your next leg. Marathon took a beating during Hurricane Irma, but after a little down time everything is fully operational again at Faro Blanco. The service from the team that works here was top-notch. They set us up with a splitter to convert our two 30 amps into one 50 amp, and to fill up with water they supplied a hose that was not conveniently located but the staff kindly hauled it out to the slip. During this delivery the wind on day one was less than favorable leaving Ft. Lauderdale. But once we were in the Hawk's Channel, which is the route between the islands and the outer reef of the Keys, the outer reefs provided a protection from the wind. You should be aware that on this route you will be surrounded by reefs and crab pots, you will notice towers marking reefs. You can keep your eyes open for crab pots, although they will be nearly impossible to avoid completely. When coming into Marathon you will go under the Seven Mile Bridge which crosses both Knight Key Channel and Moser Channel between Marathon (Vaca Key) and Little Duck Key. The bridge is fixed with a 65 ft. vertical clearance across Moser Channel. If you are in a sailboat do your research! Should you leave South Florida at a reasonable time, you can make a pit stop at the Alligator Reef Lighthouse. Here you can grab a mooring ball and discover beautiful snorkeling around the lighthouse. If you have a drone, this will be the perfect place for a photo op. Today's run should be calmer than yesterday, but we had to go south to go north. The Faro Blanco Marina measures your electricity consumption when you are departing, so you will need to go to the office in the morning when they open to pay up on your usage. It shouldn't set you back more than $8 or $9. After you check the weather and your engines, go ahead and get underway. Today's destination will be the Rose Marina on Marco Island. Again, call ahead for space, especially if you are making this trip during high season. The folks working the fuel dock were very helpful in getting us fueled up and then helped us move into our slip for the evening. You can make a run to the local Publix Grocery Store which is a 15 minute walk away should you need to re-up on any food or supplies. If you are in need of contact with humans who you have not been on a boat with for two days, for recommendations on dinner you could head to Snook Inn, which will be the restaurant with a small marina that you saw on your way in, but be prepared to wait-- it is a popular spot. If you want to walk somewhere for a quick bite, the Dolphin Tiki Bar & Grill was recommended by a few locals. The last leg this journey brought us into the in the Tampa Bay area. Because of the distance you will want to get going as early as possible this morning. Unfortunately, on the final stretch of this delivery Tropical Storm Gordon decided to rear his ugly head. And while it was a bit of an inconvenience enduring wind and rain the entire day, this was still a breeze in comparison to weather that I have witnessed 1,500 miles off the coast. With that being said, it is important to take the weather very seriously. The storm was a bit of a surprise considering it developed quickly and came out of nowhere. Thankfully, this particular yacht was equipped with indoor nav station that included throttles, chart platter and auto pilot, so fortunately for myself and the crew, we were able to stay indoors and we never had to put our foul weather gear to use. And although the foul weather gear was never used, you should always show up prepared because you never know what might happen. In addition to gear, I should mention that you should always bring a good supply of tools with you too. Taking into consideration the forecast for today, I opted to take the passage slow and hug the coastline. This allowed for a smooth and somewhat relaxing ride. I turned up the tunes, stayed at the helm station inside and took the long day slow and easy. There was one window of weather in which I was able to catch some cooler air on the flybridge, but that was short lived and it was back inside to ride out the remainder of the day. I was able to secure a slip this evening at Harbouridge Marina in St. Petersburg, FL. This quiet marina is conveniently located 18nm from the Tampa Convention Center-- the yacht's final destination. If this itinerary is a vacation for you, St. Pete has a lot to offer, most of which is in walking distance from the Harbouridge Marina, so you might consider staying for a day or two to explore the downtown area. What is next for this Captain? I intended to spend the next few months delivering yachts to boat shows around the eastern US and delivering yachts for new buyers, I'll do that in addition to instructing new sailors on how to sail and operate their yachts. While I don't frequent the long Atlantic deliveries anymore, what has changed in recent years is that all of the Leopard Catamarans are delivered to Fort Lauderdale by freighter nowadays. When those ships arrive to South Florida I am there to assist in the offload and delivery of the boats, but a one hour delivery from the port to the marina is vastly different than the 45 day deliveries that kick-started my career.